Last year my husband begged me to make a Mississippi mud pie for him. I had bookmarked a recipe in one of my cookbooks for this amazing layered cake and he just couldn’t stop talking about it! So after gathering up all of the ingredients for it, I went to work. A sink full of dirty dishes and a few hours later, we had ourselves one incredible masterpiece. The best part? The truffle-like bottom layer. It was a flourless cake. I had never attempted to make a flourless cake before so I was a bit nervous about it, but it turned out great! I’d say it was kind of like making a cheesecake. Bake it, chill it, slice into it and hope it’s dense, moist and creamy. It was. I knew the recipe was a keeper and had all of these ideas of how to make it again. 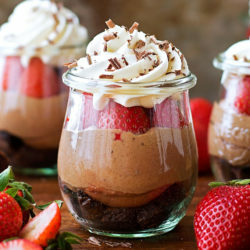 Since Stephen loves the chocolate raspberry combo (especially the Cheesecake Factory’s Chocolate Raspberry Truffle) I thought I’d make a “version” of that only with my favorite friend, Nutella. To maintain the flourless aspect of this cake I ditched the crust. It’s ok, I promise. Instead I added a handful of chocolate chunks and fresh raspberries, and boy do they make up for it! 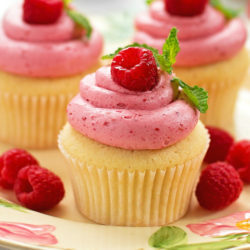 I also dusted the cake with a little bit of cocoa powder and topped it with some fresh raspberries and whipped cream. As you can tell I got a little carried away with the cocoa, the raspberries will attest to that. Oops. 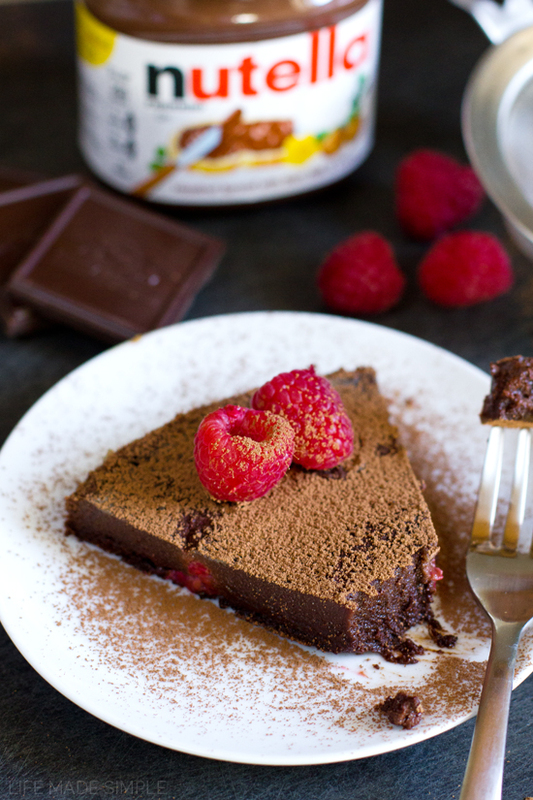 This flourless Nutella raspberry cake is so rich and dense you’ll never miss the flour. It’s chocolate/Nutella/sugar/egg base is flavored with both vanilla extract and espresso powder. Don’t fear the espresso! It’s what gives this cake it’s amazing flavor. The process is a little tedious, I’ll admit, but it’s so worth it! Once the cake has baked and chilled, it becomes rich and creamy. It’s like eating a cheese-less cheesecake. 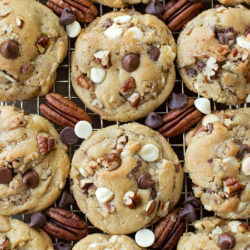 I hope you’ll give this recipe a try, I think you’re going to love it! 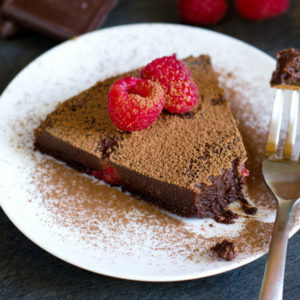 A rich and dense flourless dark chocolate cake studded with fresh raspberries. This truffle-like cake is so incredible you'll never miss the flour! Preheat oven to 350 degrees. Line a 9" cake pan with parchment paper then lightly spray or butter, set aside. Using a double boiler, melt butter and chocolate, mixing until smooth. Remove from heat, stir in the Nutella and set aside to cool. In a 1 c. glass measuring cup, dissolve espresso powder in warm water. Add salt and vanilla, set aside. In the bowl of a stand mixer fitted with the whisk attachment (note: I have two KitchenAid bowls so I used one for the whites and one for the yolks), beat the egg whites until foamy, about 2 minutes. Gradually increase speed to high and slowly add ½ c. sugar, beating until soft peaks form. If you’ve got the ice cream cone top when you lift your whisk out, you’ve gone too far! Set aside. In the bowl of a stand mixer fitted with a whisk attachment, beat the egg yolks with the remaining ½ c. sugar until the eggs are light and have almost doubled in volume, about 3-4 minutes. Add the cooled chocolate mixture and beat until just combined. Scrape down sides and bottom of bowl and with mixing speed on low, add the coffee mixture. Beat until just combined. Remove the bowl from the stand and gently fold in 1 c. of the beaten egg whites. After about 30 seconds of gentle folding, add remaining egg whites and continue folding until almost completely combined, do not overmix. Pour the batter into the prepared pan, gently sprinkle chocolate chips and raspberries over top (they will sink a little) and place in oven to bake for 38 to 40 minutes. The cake will have a semi-crisp top and will still jiggle a bit. Remove from oven and allow to cool to room temperature. The center and edges of the cake will fall a bit- this is normal. Once the cake is cool, cover with plastic wrap and refrigerate for 2 hours. To serve, invert onto a cake stand or platter, dust with cocoa powder and top with fresh whipped cream or a scoop of ice cream. *Espresso powder can be found at Williams-Sonoma, Sur La Table, King Arthur Flour or at most specialty baking stores. It's essential to this recipe as it enhances the flavor of the chocolate. -I used a 12" pan to bake the one pictured above. It will bake up much taller/thicker in the 9" pan. Yum! I’ve made a regular flourless Nutella cake, but the raspberry sounds fantastic! I love that dense pure chocolate texture! This seriously looks amazing! I have to make this ASAP!!!! 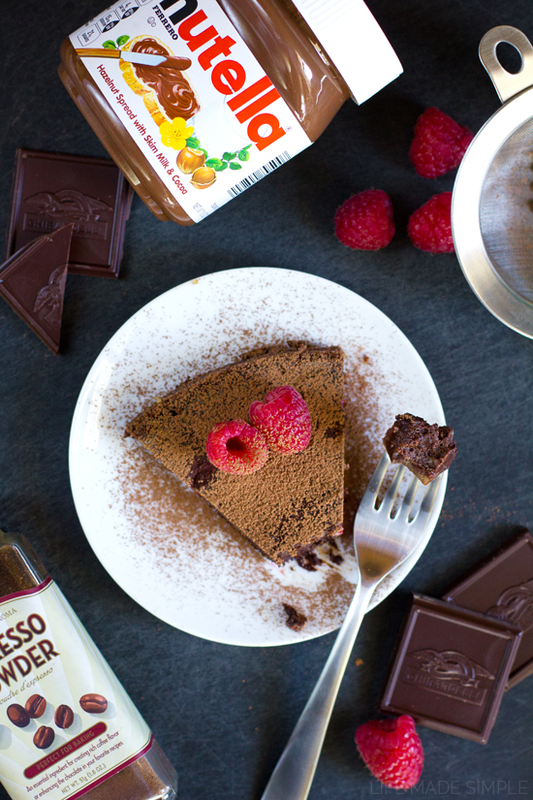 Oh my gosh, Nutella, espresso powder, raspberries? You are totally speaking to me, lady! Pinning this right now. Looked loverly. Want a flourless cake so it would be a better fit for Weight Watcher. What a bummer, this cake looks so delicious, however, at 17 points per slice for 8 slices, no way I can do it. For all those who can, enjoy.